Best Online Sweepstakes You Can Play and Win! - Win Money Online Playing Contests and Games! Are you an online sweepstakes player looking for the best and legitimate sweepstakes? Then you have come to the right place. MyScratchOff screens all sweepstakes to find only the best for you to enter online. So like our page and follow us. The more you play, the more you will win! Looking to win some free money or a great discount on clothes? 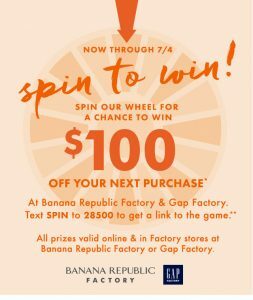 Try your luck at spinning to win at Banana Republic. You get an opportunity to win. I won 25% off today. If you have a google voice number, you can play twice to win $100! So spin to win and good luck!